Beth Ferry is the author of many picture books including the New York Times bestseller, Stick and Stone, also illustrated by Tom Lichtenheld. She has celebrated all but four of her birthdays in New Jersey where she lives and writes by the beach. Her favorite birthday dessert is chocolate cake with chocolate icing, but she also enjoys cannoli and cream puffs and churros. Since her birthday is in the winter, she almost always wishes for summer. You can learn more at www.bethferry.com. Tom Lichtenheld doodled his way through school then worked as a sign painter, set designer, printer and art director. After a long career in advertising he accidentally stumbled into the job he was always meant to do - creating children's books. 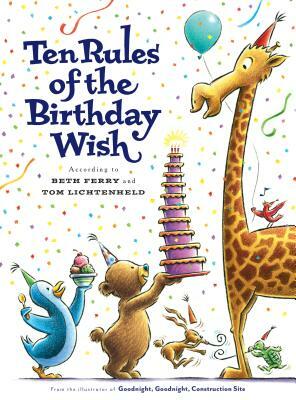 Tom's books are noted for their humor, expressive characters and rich - sometimes hidden - detail. He's known for creating books that appeal to children and adults alike, and his wide portfolio offers something for every age. In his spare time Tom enjoys riding his bike, eating chocolate, and getting other peoples' kids all wound up then sending them home. You can find him at tomlichtenheld.com and @tlichtenheld.